The college bowl season drones on with not great fanfare until we get to the Christmas week games followed of course by the excitement of the College Football Playoff starting New Year’s Day. However even with the semi-endless stream of matchups that people may care about only as alums and parents, and the occasional NCAA junkie, there is no doubt that the past year has again produced the kind of excitement in and around college football that has made it such a mega draw in towns bug and small. How exciting, well there is a way to measure the breathtaking moments, brought to us by the folks at Bay area based Thuuz (short for “enthused). Don’t know Thuuz at all? Well if you are a fan of quick, custom highlights you will probably know them more as they aggressively expand their business in the coming months, but their custom data capture is fast making the idea of “Catch Up To Live,” think your own custom NFL Red Zone that gives you your highlights but also quickly catches all the highlights you want as you try and grab a game in the third quarter, all delivered to you on whatever device you choose. Those are some of the things that Thuuz is doing with partners like FOX, NBC Sports and Direct TV, with more to come. As a game progresses, they are continuously updating these parameters and comparing them to a historical database of game parameters that has a statistical understanding of what comprises a Great Game, Good Game, Average Game, and Dull Game. From this, they identify the most exciting aspect of the game in order to construct a headline describing the real-time state of the game. Additionally, they are constantly monitoring the changes in excitement to determine when to send out alerts for different types of fans, from fanatics to enthusiasts, to casual fans all of which are giving the fans an up to the minute highlight package customized to them. So college football fans, what got you on the edge of your seats this year? Here is the list, one which leads with no surprise, but has some games you may have missed in the mix. 1. 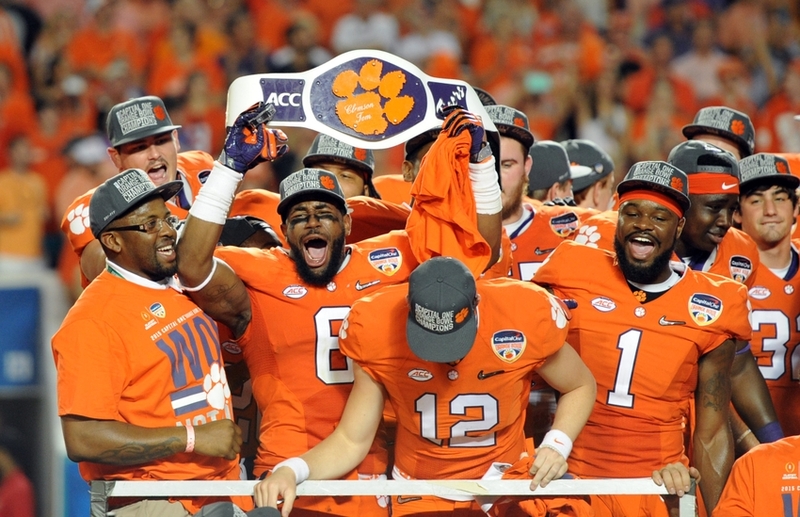 Clemson 35 Alabama 31 – 1/9- CFP National Championship: Clemson pulls off a big upset to get revenge from the previous year’s National Championship. 2. Ohio State 39 Penn State 38 – 10/28 #2 and #6 AP ranked teams face off both undefeated in conference play. Ohio State ends up making a comeback to avenge last year’s loss. 3. Oklahoma 62 Oklahoma State 52 – 11/4- A shootout for the ages: 1,046 total passing yards and 114 total points. 4. USC 52 Penn State 49 Rose Bowl: USC shuts out Penn State 17-0 in the 4th quarter to pull out a narrow 3-pt win. 5. Western Michigan 71 Buffalo Bills 68. Here ya go MAC fans. 139 total points alongside an NCAA record tying 6 OTs. 6. Alabama 31 Mississippi 24 – 11/11. Alabama finishes the games with 14 unanswered points to go ahead and remain undefeated. 7. UCLA 45 Texas A&M 44 – 9/3. 34-point comeback win for UCLA capped with a go ahead touchdown pass in the last minute. 8. Miami 24 Florida State 20 – 10/7. Miami turns back a late rally to end its 7-game head-to-head losing streak against Florida State. 9. UCF 62 Memphis 55 – 12/2. AAC Conference Championship: UCF stays undefeated moving into bowl season with a high paced back and forth win. 10. Washington State 47 Boise State 44– Washington State edges out Boise State in 3 OT. So is all this subjective data needed? Experts in the space think so, as it can help tailor programming, ad buys and most importantly, audience engagement not just for teams and leagues (Thuuz does this for almost any league or sport where a wide amount of games are carried) but for fans looking to engage on any device at any time with whatever content they would enjoy. We often say when we are at the big event we can “feel the excitement in the air.” Now with a company like Thuuz, we can measure it as well.